Nutrients originating from decomposing vegetative and animal matter are an important and necessary part of ecosystem function in Puget Sound. However, human activities have accelerated and concentrated many of these processes. Elevated levels of nutrients entering Puget Sound come from point sources such as sewage-treatment plants and paper mills, or non-point sources including fertilizers, septic systems, and animal waste. When nutrient trafﬁc loads are excessive, and combine with low circulation rates and topographic barriers, site-speciﬁc problems may arise, such as the hypoxia conditions in Hood Canal and south Puget Sound. Although freshwater runoff is a primary pathway for nutrient transport from terrestrial to marine environments, the thousands of mobile animals in Puget Sound, such as insects, birds, and ﬁsh, are also effective transfer agents of energy. Moreover, these transfers can occur in both directions and return nutrients from the ocean to freshwater and terrestrial environments. Birds feeding at sea and nesting and roosting on land can transport large quantities of nutrients (Cederholm et al. 1999). Anadromous ﬁsh such as salmon also carry nutrients back from the marine environment up into freshwater and terrestrial habitats, enriching food webs far from the sea. The life histories of these Puget Sound species reﬂect their biological requirements to move back and forth between terrestrial, freshwater, and marine habitats depositing substantial quantities of nutrients in the process. Paciﬁc salmon (Oncorhynchus spp.) accumulate most of their body mass in the sea, which is transported to freshwater lakes and streams around the Paciﬁc Rim when these ﬁshes return to spawn. Salmon migrations upstream provide critical nutrients to river ecosystems. Here, width of arrows indicates relative number of Paciﬁc chinook salmon currently migrating into main rivers. The magnitude of anadromous salmon returning to rivers is an indication of the potential for transport of marine-derived nutrients into watersheds. 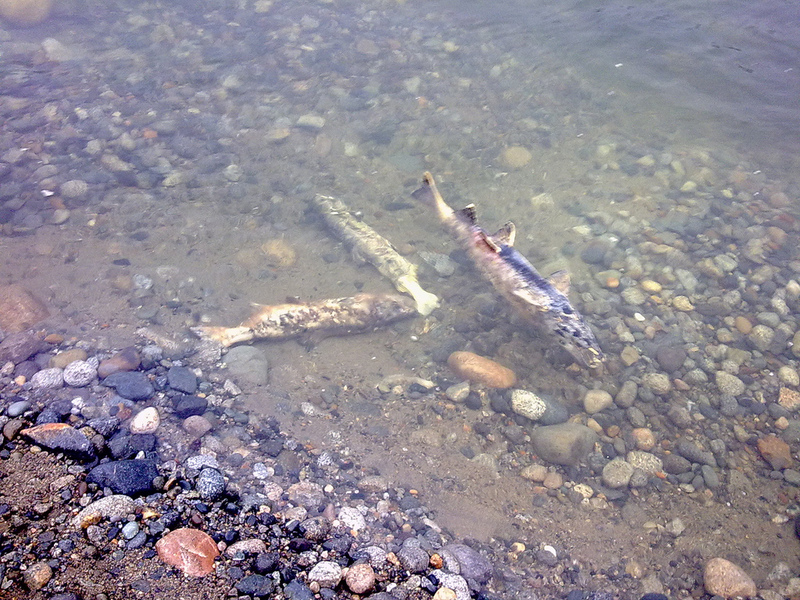 As most species of this genus generally die after spawning, the nutrients and organic matter contained in their body tissues and reproductive products are deposited near the spawning grounds. Research has shown that the annual deposition of salmon-derived nutrients contributes to the productivity of freshwater and riparian communities throughout the Paciﬁc coastal region. Nutrients from salmon also enter terrestrial ecosystems. The importance of salmon carcasses for plants, insects, bears, and birds has been well documented (Cederholm et al. 1989; Ben-David 1998). These nutrients can be incorporated into the stream food web through direct consumption of carcass tissue by ﬁsh or invertebrates or uptake of the dissolved chemicals released during decomposition of carcasses (Bilby et al. 2001). Salmon-derived nitrogen comprised from 10% to 20% of the nitrogen in some species of ﬁsh and invertebrates in a western Washington salmon stream (Bilby et al. 1996), and reaches much higher proportions in Alaskan systems supporting greater abundances of spawning ﬁsh (Kline et al. 1990).